Check out the full fight video of the IBF world flyweight champion Johnriel Casimero vs the Brit challenger Charlie Edwards. The fight was a technical kind of fight. Edwards uses the ring, circling Johnriel Casimero, but the Filipino still gets the best of it. 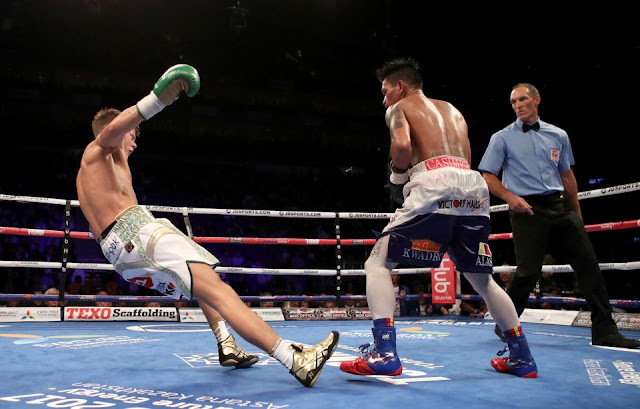 Filipino boxer teaches the Brit Edwards lessons, Casimero hurts Edwards multiple times and also was more accurate than Edwards. In round 10, Casimero connects a left hook that puts down Edwards, Edwards was badly hurt, he was stood up but the referee stops the fight to prevent more damage to the Kid from UK.